"Look for the bare necessities The simple bare necessities Forget about your worries and your strife!" This is the song that comes to mind when someone talks about or mentions The Jungle Book. 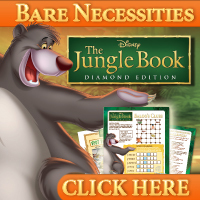 I love all of the fun and loving catchy songs from this movie, but Bare Necessities has got to be one of my favorites. So when we had the opportunity to sit down with the kiddos for a movie night earlier this week in celebration of the release of The Jungle Book on blu-ray on February 11th, I was super excited. We haven't watched it in years and when we did it was on an old DVD that we bought at a yard sale for a great price, but the DVD itself wasn't that great of a copy. So I was super excited to watch The Jungle Book on blu-ray with the kids. It's one of my favorite Disney movies with tons of lovable and hilarious characters. During the movie, my kids were singing and dancing away and it just made me smile and remember when I was younger and use to sing and dance with my siblings to the same songs. 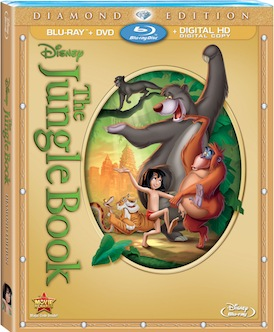 Definitely worth purchasing if you are a fan of The Jungle Book, get it before it goes back into the vault! Disclosure: All opinions are my own. I received The Jungle Book at no cost for the purpose of this review. No other compensation was received.